Let the sewing fun begin! 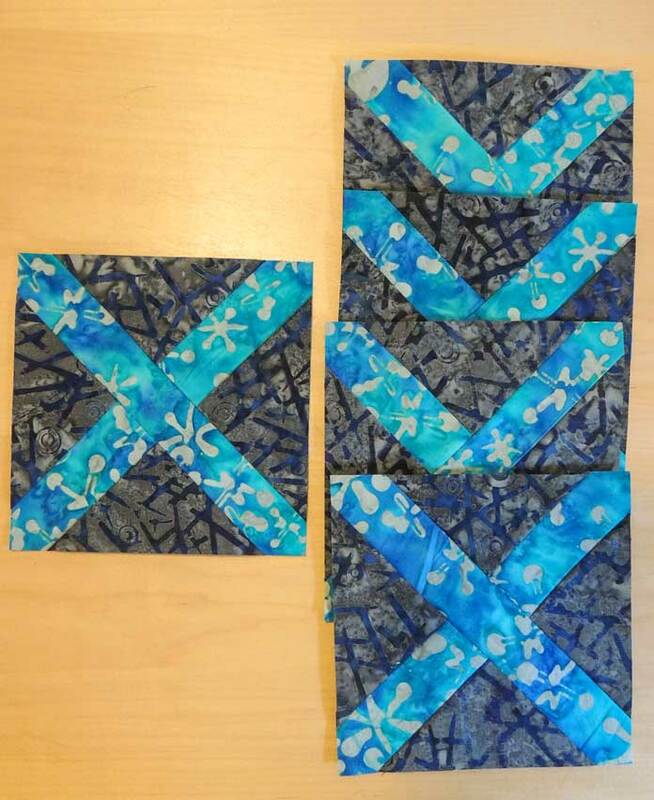 In yesterday’s post, we followed the cutting directions for the pieced X and O blocks. They’re the game pieces for the quilted game board we’ll be making later. The Recess fabric line has some bold colorways to choose from, but I chose to go with the gray-blue and the purple colorway and its masculine looking prints. 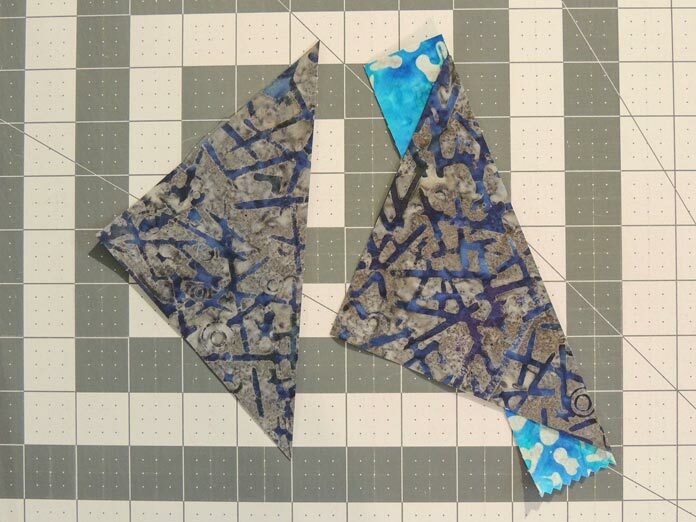 Let’s get started making the pieced X blocks! 1. 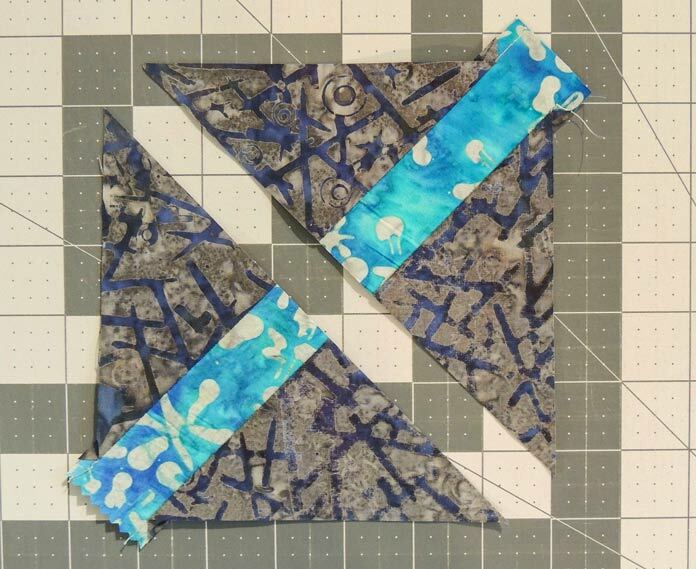 Cut one fabric X background square through one diagonal. 2. Sew one cut edge to a long side of Fabric X 1½″ x 8½″ strip; press the seam to the background fabric. 3. 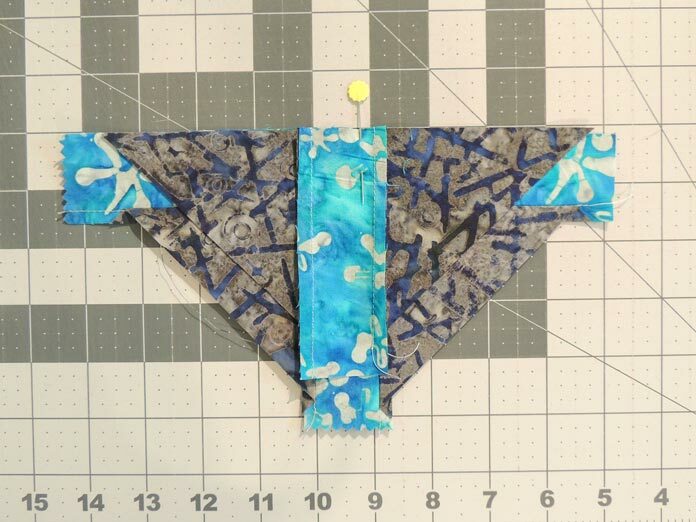 Sew the remaining background half along its cut edge to the opposite side of the Fabric X strip, lining up the two background halves using the points as visual guides. Press the seam to the background fabric. 4. Cut diagonally through the unit opposite the pieced in Fabric X fabric. 5. Sew one cut edge to a long side of Fabric X 1½″ x 9½″ strip; press the seam to the background fabric. 6. Sew the remaining half of unit along it’s cut edge to the opposite side of the Fabric X strip; this time you can also use the pieced strip in Fabric X to line up the halves visually. Line up inset strips and pin halves together. 7. Trim the unit to 5½″ square. I used a 6½″ square ruler and lined up the guidelines to make my first two cuts along the top and right sides. Then I turned my unit and trimmed again. I did this two times and kept lining up my 5½″ guide marks on the ruler as well as the diagonal line in the middle of the ruler through the middle of my Fabric X. Trim the pieced X block to size. 8. Repeat steps 1-7 to make 4 more X blocks. 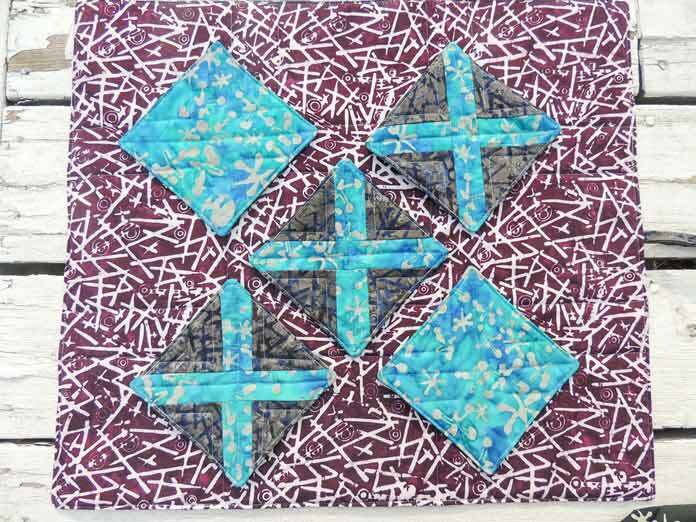 The pieced X blocks are ready. 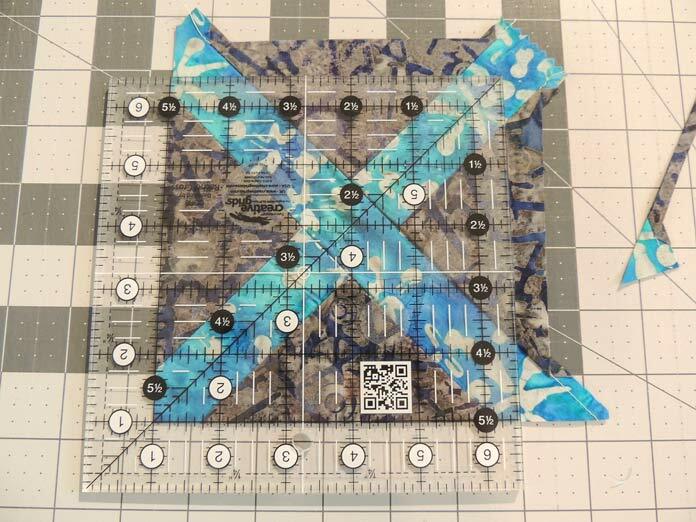 I really like the blue print from the Recess fabric line – it makes me think of outdoor fun! Stay tuned, next up we piece some O blocks. Love this for my grandson.